There are pianos. And then there is Mahler’s piano. Or Liszt’s. Or the one they say Hadyn and Beethoven might have played. And all these unique pianos live in the historical musical instrument collection in Vienna’s Hofburg palace complex. And they’re not even the focus of the displays. As you can imagine, there are one or two historical musical instruments in Vienna. 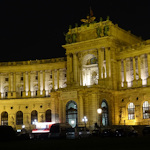 And a large number of them form the special collection housed in the Weltmuseum, itself a part of the Kunsthistorisches Museum group of institutions. The setting mirrors the collection’s contents, since the Neue Burg building was a late 19th-century extension to the Hofburg palace. The rooms housing the musical instruments begin at one end of the Neue Burg and stretch across to the other end, creating a linear journey through time that is mirrored in each room’s contents. At one end, 16th-century instruments; at the other, those of the late Romantic period and 20th century. The main thread running through the collection is the evolution of musical instruments and technologies, and the work of such names as Graf, Streicher, and Bösendorfer. Various instruments fill display cases or stand free for even closer observation. Further themes are music and court life, and the instruments of famous composers and musicians (Vienna has a few of these, too). So, for example, the collection begins with images of the triumphal entry of Emperor Maximilian into Vienna, with real examples of the 16th-century instruments found in the illustrations. These cover a rich diversity of names and forms. Like the Spinet and Regal or the Chitarrone, or shaped wind instruments that look as if designed by a hallucinating student of Greek mythology. My favourite name is the Clavicytherium, which sounds like a herbivorous dinosaur but is actually a kind of harpsichord. As you progress, the focus increasingly shifts to stringed instruments and keyboards, inevitably ending with the great grand pianos of the early 20th century. For the uninitiated ( cough…me…cough), it’s the connection to these great names that gives the collection its value. Those with a greater understanding of the history and technology of musical instruments will value the way the items on display illustrate the progressive instrument design. And those of a creative bent will value the simple artistic brilliance of many of the items, as seen in the twists and curves, the patterned inlays, the careful decoration or the glorious aesthetics of the physical designs. To access the instrument collection, you need a Vienna Pass or an entrance ticket for the Weltmuseum. At the time of writing, adult tickets cost €12, with concessions available and skip-the-line tickets purchasable online*. The collection opens Thursday to Tuesday, which is another way of saying it closes on Wednesdays. Opening hours are 10 am to 6 pm (9 pm on Fridays), but check locally for changes. Almost all written information is in German and English. Sometimes the language used goes over the heads of anyone not familiar with the vocabulary of musical instruments, e.g “The Shawm was built from the decant register to the great bass”. Um, OK. If you want to hear some instruments, rather than just look at them, pick up an audioguide. Or can I make some concert recommendations? It’s central and easily accessed on foot or by public transport. See the Weltmuseum article for details.